All of the paintings and limited edition prints shown in the Paintings and Prints sections of the Website can be bought in that section as well as in the shop. You can order items and pay for them by using our secure e-commerce facility or by emailing us the order (no credit card details please). We are highly confident of the quality and security of our e-commerce shopping cart and recommend this method of payment and ordering. This allows us to offer the best level of speed, accuracy and security in our service to you. Credit card numbers provided through the e-commerce facility are processed in real time using a 128 bit SSL encrypted link to the bank processing the payment. Your credit card details are not seen by us or stored on our computer system. So confident are we about the security of our e-commerce service, we guarantee that every online transaction you make through Aboriginal Art Online is 100% safe. This means that you pay nothing if unauthorised charges are made to your credit card as a result of using our Web site. See details of the Aboriginal Art Online Guarantee of Safe Online Shopping. Aboriginal Art Online has adopted the Australian Guidelines for Electronic Commerce issued by the Australian Government. They have been developed for adoption by electronic traders located in Australia and for dealing with both Australian and overseas consumers. Customers and users of our Web site have said how much they appreciate our quick and reliable service – for comments, see the Customer comments page. If you have questions about shopping with Aboriginal Art Online, visit our Help Section. Here you can find the answers to frequently asked questions (FAQ), read our full Shopping Policy, contact us for a personal reply or send your comments to us. All specific inquiries will receive a personal reply. All prices on our Website are in Australian dollars. If you wish to convert between Australian dollars and other currencies, please use our Currency converter. 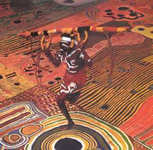 Aboriginal paintings are a rich and varied art form. This online gallery offers a fine selection of Australian Aboriginal paintings by artists from communities in the Kimberley, Central and Western Desert and Top End (including Arnhem Land) regions of Australia. The variety of painting styles in the regions is described in our Regions and communities section. Paintings are arranged by regions – click on the link to see paintings from a particular region. If you want to read a short biography of the one of the artists, go to the Art and Artistssection of our Website. The prices below are in Australian dollars and do not include packing, delivery and insurance – use the “Enquire” button to confirm availability of a painting and the cost of delivery. To check the equivalent price in other currencies, use the Currency Conversion link. Price: $2850.00 in Australia and Export. This painting shows designs associated with the rockhole and soakage water site of Kuta Kuta, north of the Kiwirkurra community. In mythological times a large group of Tingari men camped at this site before travelling north to Piparr south of Wilkinkarra (Lake Mackay). This area belongs to the artist’s grandfather. The different areas of colour depict the sandhills that the group of men followed on their travel. Raymond is the son of famous, award winning Papunya Tula artist, Patrick Olodoodi Tjungurrayi. Since events associated with the Tingari Circle are of a secret nature no further detail was given. Generally the Tingari are a group of mythical characters of the Dreaming who travelled over vast stretches of the country, performing rituals and creating and shaping particular sites. The Tingari men were usually followed by Tingari women and accompanied by novices and their travels and adventures are enshrined in a number of song cycles. These mythologies form part of the teachings of the post initiatory youths today as well as providing explanations for contemporary customs. Price: $4500.00 in Australia and Export. This painting relates to the claypan site of Muyinga, slightly west of Kintore. In mythological times a group of Tingari men camped at this site as they travelled towards the west, later arriving at an important site known as Ngurrapulangu. This is a low lying area situated at the base of a long escarpment which consists of a number of huge claypans. The many small roundels represent the soakages and rockholes that the men visited at sites further west, which included the well know site of Umari. Martin Tjampitjinpa was one of the most distinguished of the younger Papunya Tula artists. This work comes with a certificate from Papunya Tula Artists. A copy of the booklet accompanying his commemorative exhibition in 2007 is also included. Price: $1800.00 in Australia and Export. After the fire has passed leaves drop on the burnt ground. Yikwani is the Tiwi name for fire. It is also used for burning off overgrown vegetation following the heavy ‘Wet Season’ rains (which covers the period of late Spring through to early Autumn), regenerating and encouraging new growth and aiding in hunting trips. Price: $3650.00 in Australia and Export. Price: $2100.00 in Australia and Export. Roy’s paintings are always rich with story which reflects his wealth of knowledge and authority in many areas of Spinifex country and beyond. In this dense design, Roy paints Miramiratjara, a place of a serious nature in that it cannot be accessed without the accompaniment of senior custodians. At Miramiratjara there are many Wanampi (water snakes) who guard a permanent underground water supply. This area was a place that people could retreat to when all of the rockhole water had dried up in the harshest periods. Roy has indicated briefly the presence of the Karnka (crow) story at Miramiratjara being the reason for the red background. The karnka set the area on fire due to a dispute with another party. There are other aspects of the story which are sacred. Price: $1200.00 in Australia and Export. Medicine men sometimes employed plants and herbs in their rites, but they did not usually practice secular medicine. The healing of trivial non-spiritual complaints, using herbs and other remedies, was practiced by all Aborigines, although older women were usually the experts. To ensure success, plants and magic were often prescribed side-by-side. Medicine plants were always common plants. Aborigines carried no medicine kits and had to have remedies that grew at hand when needed. If a preferred herb was unavailable, there was usually a local substitute. In the deserts, the strongest medicines are made from very widely occurring plants. Fuchsia bushes (Eremophila) and bloodwood trees (Eucalyptus terminalis) grow everywhere and were used fresh,or as ground leaves. Lemon grasses (Cymbopogon) sprout on every ridge top and jirrpirinypa (Stemodia viscosa) around every water hole. In the Top End, many different kinds of large leaves are considered useful for staunching wounds, presumably because cases of profuse bleeding allow little time for searching. Aboriginal medicines were never quantified – there were no measured doses or specific times of treatment. Since most remedies were applied externally, there was little risk of overdosing. One area of Aboriginal medicine with no obvious Western parallel was baby medicine. Newborn babies were steamed or rubbed with oils to renter them stronger. Often, mothers were also steamed. A notable feature of Aboriginal medicine was the importance placed upon oil as a healing agent, an importance that passed to white colonists, and is reflected today in the continuing popularity of goanna oil. Earth, mud, sand, and termite dirt were also taken as medicines. In the Channel Country, healing mud for packing wounds was taken from the cold beds of water holes. In many parts of Australia, wounds were dressed with dirt or ash. Arnhem Land Aborigines still eat small balls of white clay and pieces of termite mound to cure diarrhea and stomach upsets. Clay and termite earth probably share the properties of kaolin, which is the white clay used in western medicine. They may also provide essential nutrients: some termite mounts are extraordinarily rich in iron -as high as two percent. But whether this can be absorbed through the stomach has yet to be determined. Artists from the Balgo community in far north Western Australia, as well being leading innovators in Aboriginal painting, have developed a distinctive style in glass. Balgo paintings are sought after by collectors and their work in glass is achieving a similar reputation of desirability. For more information, see our pages on Balgo art and artists and for short biographies see the Balgo artists pages. The prices shown are in Australian dollars and do not include packing, shipping and insurance – use the “Enquiry” button to confirm availability of a work. Postage charges are added at the checkout. Delivery to destinations outside Australia is by insured airmail. Use the Currency Converter for an estimate of the price in your local currency. Note that works from the Balgo art centre are exempt from Australian GST, so the prices shown below for Australia and export are the same (unlike on some other parts of our Web site). For more details about shopping, see our Shopping and online security section. Australian Aboriginal languages are not hard to pronounce, once a few basic principles are understood. The first is that every vowel should be clearly pronounced. As a rule, u is like the oo in the English word ‘boot’, i like the vowel in ‘bit’ and a like that in ‘hat’. If a vowel letter is doubled, then pronounce it very long. In most languages b can be substituted for p, d for t and g for k with no difference to the meaning of the word. Some people use b, d and g while others prefer p, t and k; either set of letters is satisfactory. Thus, the name of the language spoken west of Alice Springs is sometimes spelt Pintupi and sometimes Bindubi; and the name of the large black kangaroo in GuuguYimidhirr can be written either kang-urru or gang-urru. While English distinguishes between b and p (but most Aboriginal languages don’t), Australian languages recognise a distinction between two kinds of r sound (which are treated as variants of one sound by speakers of English). There is the trilled sound, written rr, similar to that heard in Scottish English, and a liquid sound, r, similar to that in normal Australian English. Where dh or th is written, they indicate a sound like d or t but with the tongue touching the teeth. The hardest sound for English speakers to master is ng. English does have this sound, but only at the end of a word; it is the sound after the a in ‘bang’. Australian languages have ng at the beginning of words. In many languages the pronoun ‘I’ is ngayu. It only needs a bit of practice to say ng at the beginning of a word. Say bang-ayu (make sure you just say ng, as in ‘singer’, and not ng + g, as in ‘finger’). Say bangayu a few times and gradually drop off the ba-. Thus, bang-ayu, bangayu, ngayu. The alphabet has only been invented two or three times in the history of the world. Speakers of one language tend to ‘borrow’ an alphabet used by some other language, and adapt it for their own needs. The English alphabet was taken from Latin, which was based on the Greek alphabet, which was in turn based on an alphabet that was probably invented in the ancient Middle East. Australian languages are now being written in a phonetic alphabet, with one symbol for each sound wherever possible (for ng we have to use two, since the Roman alphabet has no suitable letter). These Australian alphabets are being used for books, and in newspapers. For generations, Aboriginal children attended schools in which reading and writing were taught only in English, a language which some of them could not speak or understand. In the early 1970s bilingual education was introduced in some Aboriginal communities; children learn to read and write in their native language first, and later switch to English. This is a major factor in ensuring that some Aboriginal languages will survive. Many Aboriginal people are deeply concerned about the state of their languages. Language centres have been established in different parts of the country to keep the languages going. Aboriginal media associations, which broadcast radio and television programs in Aboriginal languages, are another important means of preservation. The languages are also being modified. Speakers of Aboriginal languages have evolved words and phrases to describe introduced technology, social structures and activities, and other changes that have occurred since European contact. Sometimes they borrow words from English; sometimes they make up new words; and sometimes they extend the meaning of existing words. For example, in many Aboriginal languages the word for ‘stone, pebble’ is now used for ‘money’ as well. Two new Aboriginal languages have evolved; these are ‘creoles’. One, Cape York Creole, is spoken on Torres Strait Islands and Queensland communities; the other, Kriol, is spoken across northern Australia. Many of the words in Kriol are borrowed from English, but they are pronounced with the phonetics of an Aboriginal language, put together in sentences with the rules of Aboriginal grammar, and given Aboriginal meanings (which often differ quite a bit from their original English meanings). While opinions differ about the future of Kriol, many young Aborigines in the north recognise Kriol as their ‘own’ language, and bilingual education is proceeding in this new mode of speech. Aboriginal art books cover a wide range of topics and regions. Below and on the following pages is a careful selection of the best books currently available. These include surveys of contemporary Aboriginal art and culture, overviews of art from different regions of Australia or by particular artists and accounts of rock art and Australian prehistory. Prices are in Australian dollars and do not include postage or local taxes (apart from Australian GST which is included in the Australian price) or customs duty. Books are sent by airmail to destinations outside Australia; please contact us if you wish us to use surface mail to North America or Europe in order to save on delivery charges. Use the Currency Converter to give you an estimate of the price in your local currency. This book is the complete guide to Aboriginal art of Australia featuring: extensive profiles on more then 80 art regions, art centres and artists; more than 400 illustrations of artwork, landscape and artists in their country; a comprehensive introduction detailing the history of contemporary Aboriginal art; location maps; buyer’s guide; and an exploration of the new media and styles of city-based artists. For more details see our information page. Volume Three in the Kimberley Rock Art series, this book covers rock art sites along the Roe, Glenelg, Sale, Calder, Charnley, and Isdell rivers as well as the ranges around Fitzroy Crossing and Kununurra – hence the subtitle Rivers and Ranges. The book contains over 500 images of the art and associated scenery. This region contains some of the best Wandjina art sites as well as a great variety of other images. 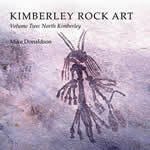 This volume is the second in Mike Donaldson’s series of Kimberley rock art books. It covers the north Kimberley coast from the King George River to Kalumburu as well as the Drysdale and King Edward rivers. Much of the area subject to this volume falls within Balanggarra combined native title claim, but there are also some sites from Wunambal Gaambera Country. It contains a fine selection of photographs of both Gwion (Bradshaw) and Wandjina art styles. Numerous excellent landscape photos of the rivers and the rugged coast of the North Kimberley help the reader to fully appreciate the setting for the art. The book weighs 3.3 kg so only surface parcel post has been quoted – please contact us if you wish the parcel to be sent by air mail (approximately twice the cost). The National Museum of Australia holds an outstanding collection of Papunya Tula art including many large canvases. Most of these paintings have never been seen in Australia in the three decades since they were painted. This book is the catalogue accompanying a landmark exhibition of the Museum’s collection of Papunya paintings from the 1970s and early 1980s. It contains numerous illustrations of the major works as well as images of the artists at work and in their country. It contains essays by John Kean (an early Papunya coordinator), Phillip Batty, Vivien Johnson and Fred Myers. The paintings are organized chronologically. The Mitchell Plateau area in Western Australia’s Kimberley region has some of the world’s most spectacular and ancient rock art, but much of it is remote and rarely seen. This beautifully illustrated book has more than 600 images of the art and its setting. All images have been approved for publication by the traditional owners. The book includes a comprehensive introduction covering early descriptions of the art and brief summaries of archaeology, geology and the importance of past sea-level changes. 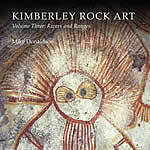 This is the first of 3 volumes covering the rock art of the Kimberley region. The book weighs 3.3 kg so only surface parcel post has been quoted – please contact us if you wish the parcel to be sent by air mail (approximately twice the cost). This collection of stories and artworks provides an exquisite insight into the individual and family histories that make Tjala Arts at the forefront of the Western Desert painting movement. Tjala Arts is located at Amata in the Anangu Pitjantjatjara Yankunytjatjara (APY) Lands of South Australia. This book weighs more than 2kg so unfortunately the postage charges are high. This book is an essential work for anyone interested in Aboriginal art and culture. Distinguished indigenous and non-indigenous authors have contributed chapters and articles across a vast range of subjects, covering the whole range of art including photography, sculpture, film, theatre and painting. The emphasis is on visual arts and there are numerous biographies of individual artists. The book weighs over 2kg, so the postage cost is unfortunately rather high. This is an excellent general overview and introduction to Aboriginal art, organised by regions and well illustrated. Aboriginal art books cover a wide range of topics and regions. Below and on the following two pages is a careful selection of the best books currently available. These include surveys of contemporary Aboriginal art, overviews of art from different regions of Australia or by particular artists and accounts of rock art and Australian prehistory. the newly published Aboriginal Artists Dictionary which is set to become the major biographical reference work on Aboriginal artists from the central and western deserts and Kimberley region. the Jukurrpa Diary 2005 – a superb desk diary and calendar, illustrated with examples of the finest contemporary Aboriginal art. If you wish to buy one of these items, click on the “Order” button on the item below. Prices are in Australian dollars and do not include postage or local taxes (apart from Australian GST which is included in the Australian price) or customs duty. Postage charges are shown in the drop down menu and are added at the checkout. Books are sent by Economy Airmail; please contact us if you need to have faster delivery. Use the Currency Converter to give you an estimate of the price in your local currency. Before the European invasion in 1788, there were between 600 and 700 distinct ‘tribes’ in Australia. Each had its own territory, its own political system and laws, and its own language. The 600 to 700 tribe-nations spoke, between them, between 200 and 250 languages. These were separate languages, as distinct from each other as are French and German, or Chinese and Japanese. Sometimes two or three, or even five or six, adjacent tribes spoke what were really dialects of one language. In other situations a single tribe spoke its own language, different from the languages of neighbouring groups. The first words from an Australian language were written down in 1770 by Captain Cook, from the Guugu-Yimidhirr people at the Endeavour River in North Queensland. They included kang-ooroo, the name for a species of large black kangaroo. When Governor Phillip brought the first group of convicts to Sydney in 1788, he took down some words in the local language, Dharuk. They included a number which have since been adopted into English, such as boomerang and din-go ‘tame dog’ (now used in English for ‘wild dog’). As settlers spread out from Sydney they encountered many different Aboriginal languages. Then, in 1841, the explorer George Grey studied some of the vocabularies that had been collected from different localities and noticed some similarities between them. For example, the word for ‘water’ at Adelaide was kauw-ee and that at Perth gab-by or kuyp-e; but a tribe not far from Perth had kow-win for ‘water’, a form very similar to that used at Adelaide. Grey suggested that the languages of Australia might be related as members of one ‘language family’. Across the languages of the continent there are some words that recur – nouns such as jina ‘foot’, mala or mara ‘hand’ and mayi ‘vegetable food’, and verbs such as pu- ‘hit’, ka- ‘carry’ and nya- ‘see’. There are also similarities of grammar. The ending used on a noun when it is subject of a sentence is -lu in some languages and -ngku in others. A number of languages show both affixes. In the language spoken in the Western Desert (covering a large part of Western Australia, as well as portions of South Australia and the Northern Territory) the names of people take subject ending -lu, while common nouns (such as ‘man’, ‘girl’ or ’emu’) take -ngku. This is all extra evidence that the languages are related, as George Grey suggested in 1841. Most of the languages from Europe across to north India have been shown to belong to the IndoEuropean language family. They are descended from a single original language which is believed to have been spoken about 7000 years ago, somewhere between the Black Sea and the Baltic Sea. In exactly the same way, linguists have shown that almost all the languages of Australia belong to one language family. That is, they are all descended from one original language which may have been spoken somewhere on the central north coast (quite possibly in the vicinity of Darwin) many thousands of years in the past. Aborigines then moved out over the whole continent. One tribe-nation would have split up into two or three new groups, which would have spread out in different directions. Language is always changing and over time what were just different dialects developed into distinct languages, that were no longer mutually understandable. There were eight or more separate languages spoken in Tasmania. Unfortunately, only a few fragments were recorded before their speakers died or were killed. There had been no contact between Tasmanians and mainland Aborigines since the Bass Strait was submerged at the end of the last Ice Age, about 10 000 years ago. It is impossible to tell whether Tasmanian and mainland languages were originally related. No relationship has yet been proved between Australian or Tasmanian languages and languages spoken anywhere else in the world. Those languages that differ most from the common Australian pattern are found in the north, from the Kimberley in Western Australia to Mornington Island and Burketown in the Queensland Gulf Country. Some of these languages have developed very complex structures – often a single word will express what in most languages would be a sentence of several words. Most of these northern languages can be shown to belong to the Australian language family; Rembarrnga, for instance, has pu- ‘hit’, ka ‘take’ and na- ‘see’. There are just a few languages such as Tiwi from Melville and Bathurst Islands that seem really different. Either they are not related to other Australian languages, or else they have changed so much that a connection cannot now be recognised. Australian languages have a rich cultural heritage – long narrative and song cycles have been handed down from parent to child for thousands of years. These provide an explanation of how the world was created by Dreamtime ancestors. Each tribe had its own song styles, which often had a special metrical pattern, and used special words not in the everyday language style. Many tribe-nations had a special ‘avoidance’ style of speaking, which had to be used in the presence of a relative with whom one could have only formal contact (with no joking), according to the laws of the kinship system. A man and his mother-in-law, or a woman and her son-in-law were often not allowed to look directly at one another, and had to use an avoidance speech style when in the other’s presence. Avoidance styles had the same grammar as the normal, everyday language style, but showed a number of different words. by posting us a signed order with your credit card details or a cheque drawn in Australian dollars made out to Aboriginal Art Online Pty Ltd.
All contracts of sale are governed by the laws of the Australian Capital Territory, Australia. Credit card numbers provided through our e-commerce facility are processed immediately in an encrypted form (using SSL encryption) over a secure link and are not stored permanently. This provides a high level of security protection for our customers. The secure link is provided by our e-commerce service provider eMatters and the transaction is processed by the National Australia Bank, one of Australia’s largest and longest established banks. More information about the system is available from the eMatters Web site at www.ematters.com.au. Internet browsers have built-in security mechanisms to ensure that users do not accidentally submit personal information over an insecure link. If a user tries to submit information to an unsecured site, the browsers will, by default, show a warning. In contrast, if a user submits credit card or other information to a site with a valid Server ID and an SSL connection, the warning does not appear and the secure connection is seamless. The URL in the browser window displays “https” at the beginning of a transaction instead of http. In Internet Explorer (IE), a padlock icon appears at the end of the Internet address window. IE users can check the Web site’s encryption level by following these steps: right-click on the Web site’s page and select Properties, then click the Certificates button. In the Fields box, select “Encryption type” – the Details box shows you the level of encryption. For customers in Australia, your bank cannot hold you liable for more than AUD $50 of fraudulent charges to your credit card. If your bank does hold you liable for any of this AUD $50, Aboriginal Art Online will cover the entire liability for you, up to the full AUD $50. For customers in the USA, under the US Fair Credit Billing Act, your bank cannot hold you liable for more than US $50 of fraudulent charges to your credit card. If your bank does hold you liable for any of this US $50, Aboriginal Art Online will cover the entire liability for you, up to the full US $50. We will cover this liability only if the unauthorised use of your credit card resulted through no fault of your own from purchases made at Aboriginal Art Online while using our secure e-commerce service. In the event of unauthorised use of your credit card, you must notify your credit card provider in accordance with its reporting rules and procedures. To obtain a refund from us of any charges made to you by your bank, you will need to provide us with documentary evidence of that charge and evidence that you reported the unauthorised use in the manner required by the bank. Aboriginal Art Online offers for sale over our Web site a selection of paintings and limited edition prints. Art works are held by the suppliers to Aboriginal Art Online and we act as their agents in selling the works on a commission basis. In this way we are able to keep our cost structure low and pass on the benefit to our customers in the form of competitive prices. Some of the suppliers of art works are in distant areas and completing a sale may require contact with Aboriginal communities in very remote places. This remoteness can at times cause delay in shipping. If this occurs we will warn you of any delays. While the artworks will be shipped by suppliers, responsibility for successful completion of your order lies with Aboriginal Art Online. Aboriginal Art Online also stocks and offers for sale a limited selection of books, maps and CD-ROMs. Responsibility for all aspects of sale and delivery of these items lies with Aboriginal Art Online. Art works ordered through the Web site will be shipped whenever possible within three working days of receiving the order and completion of payment (there may sometimes be a delay if the work is being supplied from a remote location). For limited edition prints, and for paintings that can be sent rolled in a tube, the method of shipment will be economy airmail through the Australian postal service. For paintings that cannot be rolled and must be shipped flat, the method of delivery will be by approved carrier such as Fed Ex or TNT. All shipments of art works are insured and the shipping charge includes the cost of this insurance. Books, maps and disks supplied by Aboriginal Art Online will be shipped by economy airmail through Australia Post. They will be sent within 48 hours of receiving the order and completion of payment. Orders should usually be received within two to three weeks from the date of placing the order. The time taken for goods to arrive will depend on the location of both the customer and the supplier of art works, the size and weight of the order and the method of shipping. Shipments from remote areas to destinations outside major population centres may take longer than three weeks. Shipments may require confirmation by signature that the goods have been received by the person who placed the original order or their agent. Signature on receipt is an important part of our order tracking process and helps to maintain security for the delivery of orders. For valuable items, orders will only be shipped to a confirmed address and where the recipient is able to sign for the delivery of the artwork. Orders for valuable items can not be shipped to a Post Office box or other address where it is not possible to confirm receipt by the person placing the order. Please notify us if your goods have not been received within twenty one days from the date of placement of the order. We will track the shipment and advise you by email or telephone when it is due to arrive. If you are not satisfied with the quality of an art work or the accuracy of its presentation on our Web site, you may return the artwork to the Aboriginal Art Online supplier and we will refund your purchase price. You may do this provided you contact us and provided that the work is returned to the supplier in its original condition. Please note that we can not refund the purchase price for a painting that you decide you do not like after it has been delivered, but which was accurately described and presented on the Web site. If you have any doubt about a work, please contact us before you buy it and we will try to satisfy any questions or concerns that you may have. To return an artwork, you should first contact Aboriginal Art Online within seven days of receipt of your order to indicate that you wish to return the work. We ask that you contact us in writing (by email or letter) giving the reason for the return so that we can clearly understand your concern and to allow us to confirm the best way to return the work. When you receive a reply from us confirming that we are aware that you wish to return the work, please wrap the package securely with its original packing invoice and send to the address of the Aboriginal Art Online supplier indicated on the packing slip. If you do not have the invoice, please write the number and date of the original order on a separate piece of paper. As the artwork will be at your risk until it is received back by the Aboriginal Art Online supplier, we recommend that you insure the return shipment. Any item supplied by Aboriginal Art Online (a book or map in its original condition or any unopened CD-ROM, specially packaged and sealed by the manufacturer) may be returned to us for a full refund of the purchase price. The cost of returning an unwanted item to Aboriginal Art Online, including insurance if chosen, is to be borne by the purchaser returning the goods. We will notify you by email of your refund, once the returned item has been received in good condition either by us or by the supplier. Please note that we can refund the shipping costs (original delivery plus return) only if the return is as a result of our error. All prices shown in any currency other than Australian dollars are indicative only. If you purchase an item by credit card, the charge shown on your credit card statement will be determined by your bank or credit card company according to their rules. The currency converter on our Web site gives you a close idea of the price in another currency but is not exact. Your card will be charged in Australian dollars regardless of the currency that you select to view the prices in and the charge may not be exactly the same as the indicative price shown on our Web site or sent to you by email. Some banks and credit card companies charge a fee for currency conversion. Also, some banks and credit card companies do not process a currency transaction on the same day that the transaction takes place, so if the exchange rate changes in that time, the price charged to you may go up or down. Payment of any local taxes or duties outside of Australia is the responsibility of the customer receiving the goods ordered from our Web site For customers resident in Australia, GST will be charged where applicable on all items purchased. For customers resident outside Australia, customs charges may be levied when a package reaches your country. We are not responsible for these charges and cannot provide estimates as to what the charges may be. You may wish to contact your local customs office for further information.